There are two useful reference numbers sent to eWAY for each regular transaction: the TransactionNumber and the InvoiceReference. The TransactionNumber is meant to be the merchant’s invoice reference (e.g. an order number), and the InvoiceReference is meant to be the customer’s reference (e.g. an order number). 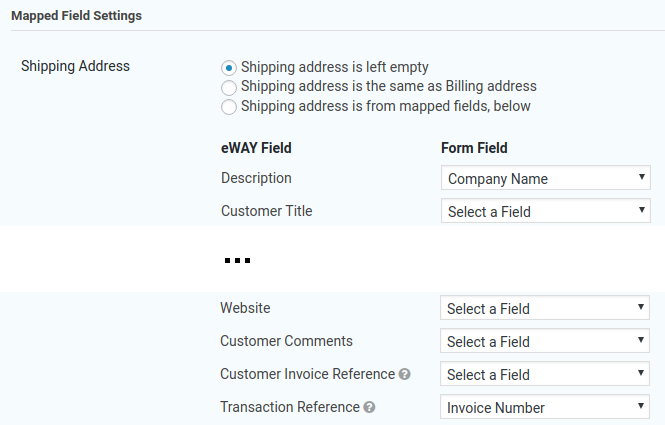 When I added support for mapping a field to a reference number, it was pointed out to me that the InvoiceReference isn’t what is shown on eWAY’s hosted page for accepting card details. Somehow, I twisted that in my head to mean that I had the mapping around the wrong way, so I “fixed it”. Which meant that for some time now, they’ve been mapped incorrectly! if you use filter hooks to set the TransactionNumber or InvoiceReference, please check to see if it’s doing what you want it to do! Delayed actions support for Zapier has been updated. The Gravity Forms Zapier add-on uses the add-on framework these days, so the old integration method wasn’t delaying Zapier actions any more. Fixed in this release. When a form is configured to send the customer to eWAY’s Responsive Shared Page to complete their purchase, cancelling the transaction used to log an error D4406 in the notes for the form entry. It now logs the somewhat more useful message “Payment was cancelled by the customer”. API keys and passwords that contained some special characters are now accepted by the add-on settings page. When logging is enabled for the add-on, the AccessCode returned by eWAY is now logged, to assist with debugging problems.